Germany committed genocide against the Herero tribe in then Southwest Africa during its colonial occupation in the 1890s. The best evidence shows the Germans slaughtered members of the tribe because they believed they were genetically and mentally inferior. The tribe was not guilty of treason and not provoked the German savagery by its own massacres of Germans. The butchery of the Hereros was not during wartime when excesses are inevitable. Those who survived the initial German genocide revolted against their brutal treatment with the Hoitentots in 1904, but were viciously destroyed with vastly superior arms or otherwise. Substantial evidence implicates France in Algerian genocide during 1954-62 war of independence in which more than 200,000 Muslims were slaughtered. Senior French officers who fought in Algeria have recently confessed that torture and summary executions were routine grisly instruments of French warfare. President Chirac and Prime Minister Jospin, however, have fiercely opposed a parliamentary inquiry into the genocide as exploring a subject best left to historians. Belgium is seemingly guilty of genocide during its gruesome colonization of Belgian Congo under King Leopold II. The genocide spurred the legendary book by Joseph Conrad, Heart of Darkness. The King deliberately inflicted on numerous Congolese tribes conditions of calculated to bring about their physical destruction in whole or in part. Belgium’s ugly Congo genocide has been recently chronicled in the book, King Leopold’s Ghost. Portugal’s apparent genocides uncurtained in Angola, Portuguese Guinea, and Mozambique during colonial years. The Portuguese sold back tribal members as slaves, and inflicted brutal conditions of slave and caused death to Angolan, Guinean, and Mozambican tribes. Spain seems implicated in the genocides of hundreds of Caribbean and Central and South American peoples, like the Mexican Aztecs, and the genocide of Basques in mainland Spain. Spanish killings and enslavements of indigenous tribes and peoples are notorious, and stretched over centuries. Ditto for Spanish Basques living on the border with France. Slavery was not ended in Cuba until Spain’s defeat in 1898 Spanish-American war. Spain may also have been guilty of genocide in Spanish Morocco during its colonization. The British apparently committed genocide of the Irish during the Great Potato Famine, 1845-48. the Irish lost ½ their population from emigration provoked by starvation conditions, and the British aggravated the starvation by callous policies permitting the exports of foodstuffs from Ireland during the famine calamity. The state of New York in the United States teaches the Potato Famine as an example of genocide. Austria is guilty of the Jewish Holocaust. The sole reason it escaped that hideous stigma is because of Cold War politics after World War II when it was occupied by the West and the Soviet Union until 1955. Greece is guilty of genocide of Ottoman Muslims in Crete and of Turkish Cypriots in Cyprus twice, 1963-64 and 1974. 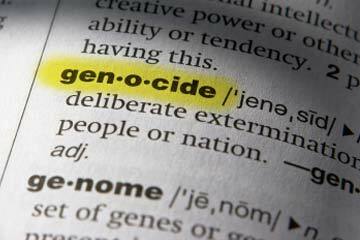 The evidence of genocide is voluminous, including testimony from former U.S. Undersecretary of State George Ball and foreign reporters on the scene. Italy is guilty of genocide in Ethiopia and Somalia during its colonization and war aggressions, and a co-inspirator in the Jewish Holocaust as an ally of Hitler’s Third Reich. The Dutch seem indictable for genocide of Indonesian tribes during its long colonial rule that ended only after World War II. The Dutch slaughtered and subjugated indigenous populations for economic gain and a belief in their racial and religious superiority. The United states is seemingly guilty of genocides of several Native American Indian tribes and blacks during slavery. The Sand Creek massacre of helpless Indian woman and children and General Phil Sheridan’s fighting fighting creed that only good Indian is a dead Indian exemplifies the former genocides. The lethal conditions of black slavery captured in Harriet Beecher Stowe’s Uncle Tom’s Cabin illustrates the latter genocide. Neither country is a EU member, but both associated with its lofty ideology of moral superiority, and were former colonies of Great Britain. Both under the colonialism of the latter and during their early years of independence, these twin nations committed genocides against Australian aboriginals and New Zealand Maoris, respectively.